Fat Face Chambray Louisa Textured Cotton Bardot Top. UK 12 EUR 40 US 8. It is a Fat Face size 12. Cotton floral top. The care label has been removed but other than that it's still in great condition. Fatface Black And White Top Uk 14. Dispatched with Royal Mail 2nd Class. This is a cotton top with a small keyhole back with a tiny button with spare still attached to label. It has a double flat frill down the front as shown. I bought this last summer but never wore it. So maybe a few creases from storage. Length 24 inches shoulder to hem. This is a stunning top from FATFACE. Short sleeves with a scoop neck. Pit to pit approx 20". Very pretty lace top with a full button down back (12 buttons with a spare). Machine washable. 79% cotton and 21% polyamide. FAT FACE: GORGEOUS LADIES COTTON TUNIC STYLE TOP Button back sleeves and buttons on the bodice. Size 12 - lovely! Pretty floral design in Teal and bright pink. Longer length t shirt. Tab with 3 buttons at back of neck(non opening). Turn back sleeves. Length from top of shoulder to hemline: 23". round neckline with 3 button up fastening to the back. Blue/White Cotton. material: 100% cotton. A pretty summer top. Excellent condition. I'm happy to answer any queries you may have. I post 2nd class signed for, twice a week as soon after payment as possible. If you have a moment please take a look at my other items. Many thanks. Top has a scoop neck and a 2 button and tab fastening, it has teal, pink and gold embroidery. FAT FACE Cotton TOP Ladies UK18. In VGC, no issues. Scoop Neckline. 3/4 Sleeves, cuff to pit: 12". FAT FACE WHITE LONG-SLEEVED SHIRT/BLOUSE - SIZE 14 - BUTTON CUFFS - SIDE SPLITS - BUST 40" - EXACT LENGTH 27" - A COUPLE OF SMALL BLACK SPOTS ON FRONT (SEE PHOTO). Fat Face Long Navy Blue Linen Short Sleeved Top Size 10. Good Condition. Great top in good condition. It's a Fat Face size 12. (it's a fairly generous 12 in my opinion). Floral sleeveless top. The care label has been removed but other than that it's in great condition. Size 10, cheesecloth cotton, tie at the neck, with open stitching detail, pattern around the bottom. Hip length. From a smoke free house. Crochet detailing. Fat Face top. Buttons to v neck. Length: 26" (from shoulder). THIS ITEM IS PRE-OWNED, BUT, IN EXCELLENT CONDITION. White and taupe striped crew t.shirt from Fat Face. 100 cotton and lovely quality. Perfect condition - tag remains attached. 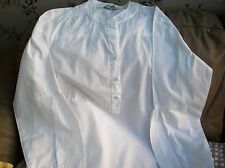 Fat Face White Long Sleeve Cotton Button Up V Neck Blouse Top, Size 14 Casual Sp. Condition is Used. Dispatched with Royal Mail 2nd Class. A lovely Sundress top. Generous size. Excellent condition. I'm happy to answer any queries you may have. I post 2nd class signed for, twice a week as soon after payment as possible. Many thanks. GREAT LADIES FAT FACE TUNIC TOP SIZE 14 IN V.G.C. THIS TOP HAS A FEMININE FLATTERING STYLE AND FEATURES A PRETTY FLORAL PATTERN WITH 3/4 LENGTH SLEEVES. Fat Face Smock T Shirt Top Size 12. Condition is Only worn once. 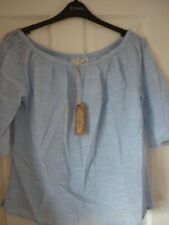 Fab cotton smock neckline. Colour is rusty red. Dispatched with Royal Mail 2nd class. FAT FACE TUNIC TOP IN SIZE 12. IN NAVY WITH MULTI. COLOUR FLOWERS. 3/4 SLEEVES, SIDE SLITS. Has been worn but in as new condition. 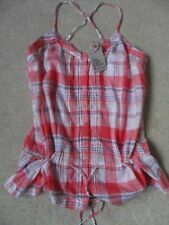 Ladies Fat Face vest top/cami BNWT!! Size UK14 • pit to pit 19” • shoulder to hem 27.5” Ivory white with multicoloured embroidered details Cotton and linen From smoke free home Thank you for looking! FROM THE TOP SHOULDER TO THE BOTTOM - 28", BUST APPROX. - 40", TIE BACK, LABEL SIZE UK 14, LOOSE FIT. Fat Face Size 10 Deep Plum Cotton Blouse. Condition is Used. Dispatched with Royal Mail 2nd Class. Top is sleeveless with a square neck, it has a single button fastening at the back, it has inset bands of cotton crochet lace. Fat face white linen and lace top size 10. Condition is Used. Worn few times so in good condition. Thank.you for looking Postage will be 2nd class and proof of posting obtained. ladies tops size 18. Condition is Used. Dispatched with Royal Mail 2nd Class. THIS IS THE MILCOMBE 3QTR TUNIC TOP IN 100% COTTON JERSEY SO THIS IS A COMFORTABLE STRETCHY TOP- NATURAL IVORY - (WHITE). Broderie Anglaise. SLEEVELESS VEST TOP. with Racer Back. FAT FACE . 100% Cotton. In Very Good Condition . & Pleated Detail on Back. Fat face Long Vest Top. Very pretty Lacey detail on reverse. Selling due to lack of space. Lots more to come. From a smoke free home. Fat Face Longline Vest Top, Size 12, Stone colour with dark grey abstract design, dipped hem at the back. Excellent Condition. 38% viscose, 33% cotton, 23% modal, 6% Linen. Bust measures 37”. Condition is Used. Dispatched with Royal Mail 2nd Class. Hi I have a pretty cotton Fat Face blouse flower pattern all over in a size 10 - can be smart or casual. It has a scoop neck, buttons up the front with pin tuck detail to chest, fitted shape with shaped hem. ladies tops size 18 used. Condition is Used. Dispatched with Royal Mail 2nd Class. Double buttoned sleeves which can be worn down, turned up or rolled up and attached. Buttoned pocket on both sides at front. Fat Face Retro Floral Print Cotton Blouse Size 16 Gorgeous! 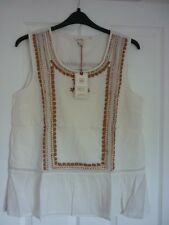 BNWT FAT FACE IVORY CROCHET FRONT VEST TOP - UK SIZE 14 - NEW !!!!!!!!!!!!!!!!! !